This is a professional “through the lens” teleprompter. Our prompter sits on your tripod and then your camera sits on the sliding 15mm rods of our prompter plate. The speaker looks directly into the lens to read the copy. This type of unit is most commonly be found on video production sets and newsrooms. If working with talent with little to no experience using a prompter, it is suggested that they watch “Ten Top Teleprompter Tips” located in the footer of this page. The average set up time takes less than 30 minutes. Although we recommend sending scripts, in word format, to us in advance, you can give the script to the operator on set. Minor changes to the script can be made when the prompter is not actively scrolling. 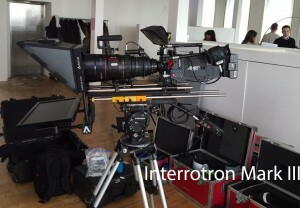 The Interrotron Mark III contains a director’s unit and a talent unit. The director’s unit allows the interviewer to not only engage in a face to face conversation with talent, but also judge quality of footage and provide direction. The talent unit, on the other hand, gives the talent the comfort of speaking to a person, rather than a lens, whilst still achieving the affect that they are looking into the camera. The Interrotron Mark II only contains a talent’s unit. While the talent will see the director/interviewer’s face projected in front of the camera lens, the director will need to look directly into a camera instead of a monitor displaying the talent’s face. For lower budget shoots or projects with extensive travel, we recommend the EyeDirect. 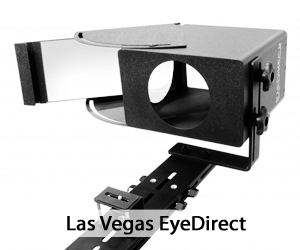 The EyeDirect achieves the same effect as the Interrotron for a fraction of the cost and without the bulky equipment. 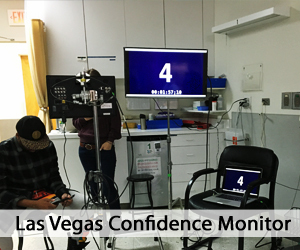 It utilizes a mirror system so that the director and talent can have a face to face conversation, while still appearing that the talent is looking into the camera. The unit includes an iPad mount (iPad not included) as it can be used as an iPad teleprompter as well. The unit comes in a custom fitted Pelican case which protects it while being shipped. The case weighs 30 lbs and is just a bit larger than the typical airline carry on bag. 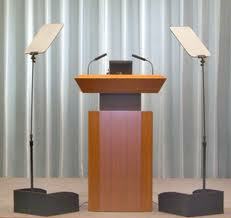 The Presidential Prompter is the most popular unit for live events. This is especially popular at graduations, conferences, award shows and presidential speeches. TeleprompterRental.com has experience prompting for all of the previously mentioned events and more. It consists of two glass panels on thin steel rods which are positioned on either side of the podium. A monitor is placed at the base of the system and projects the script onto the glass for the speaker’s viewing. The glass is formulated in such a way that only the speaker sees the text, while the audience does not and instead sees the speakers face through the glass. It is strongly advised that the operator be called to the venue prior to the start of the event so they can work with the speaker and adjust teleprompter settings and fonts, etc. to what is most comfortable for talent. Operators arrive on set with backup laptops should any (although rare) a system failure occur. The size and number of monitors varies depending on the venue and preference of the client. For unique set ups and additional monitor requests, please call Bill at 917.414.5489. 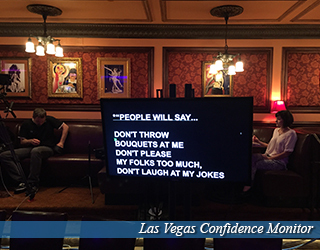 When there is no podium for a speaker to address his/her audience, the confidence monitor comes into play. It’s a small, “flat screen” HD monitors which can receive any receive signal form a teleprompter. This can be placed on stage, off stage, or behind the audience. This gives the talent/speaker/performer the freedom to move about the stage, or even the room, while still having a script easily accessible to him/her. This compact unit is great for shoots with constant travel involved and/or a tight budget. 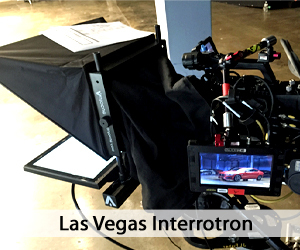 The prompter can be set up in under two minutes and can be mounted to a stand (not included) in front of a camera. The iPad projects text to the glass placed in front of the camera lens so that the talent can look into the camera and read the text. Please note however, that most iPad prompter apps do not allow live scroll adjustments. This means that the talent will have to keep up with the pace of the iPad scroll, rather than speak at his/her own natural pace. The time is here again for NAB in Las Vegas! No… what happens in Vegas will not stay in Vegas! We are preparing to WebCast some events and so by definition thousands or millions of people outside of Nevada will be privy to all. I’m inserting a bit of levity, but this is serious, folks. The National Association of Broadcasters is holding its annual trade show at the Convention Center here in Sin City. New technology in cameras and the world of video editing software will be on display. Their tagline “Where Content Comes to Life” is quite appropriate. Everyone is full of energy and delight. We at the American Movie Company are happy to be here and excited to participate in all the fun. Some of our clients have been coming here since the mid nineties. We’ve scheduled a few days of abandon. A sojourn to Reno, The Biggest Little City in the world is in the cards! Next week we head back to NY to immerse ourselves in a huge shoot involving Live Streaming. Teleprompters, Interrotrons, Confidence Monitors are on hold! The Las Vegas Strip is a stretch of South Las Vegas Boulevard in Clark County, Nevada, concentrated with resort hotels and casinos. The Nevada Film Office offers a wide range of resources, services and several tax incentives to filmmakers, both resident and non-resident. 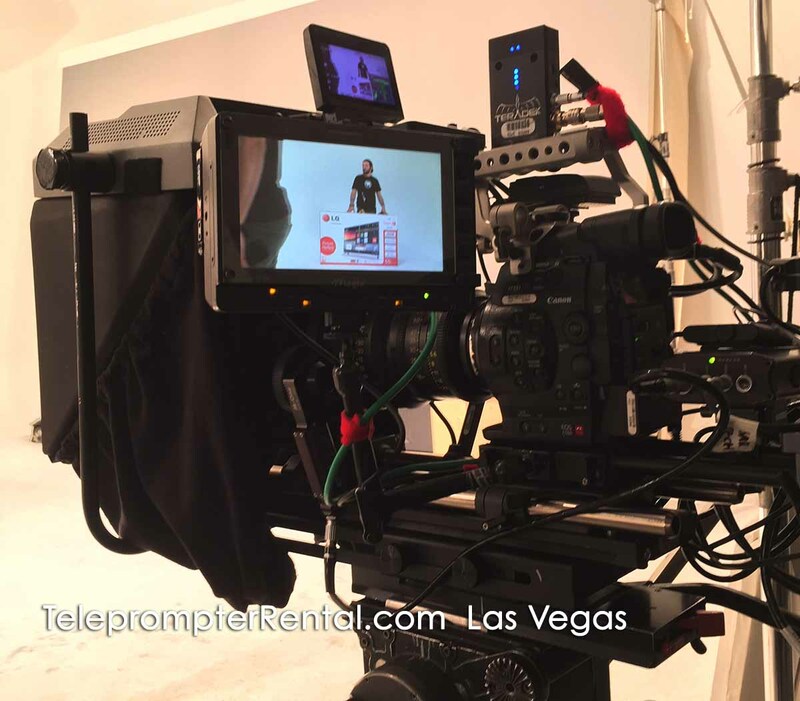 TeleprompterRental.com serves most major media centers in North America with professional prompter operators and Standard Teleprompters, Presidential Teleprompters, Interrotrons, Confidence Monitors, EyeDirects and iPad prompters / EyePrompts. 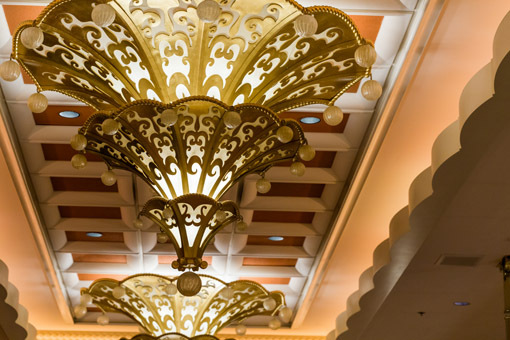 One of the most visible aspects of Las Vegas’ cityscape is its use of dramatic architecture and lights. Famous films that have been shot in Vegas include Oceans 11, The Hangover Part III and The Godfather Part II. 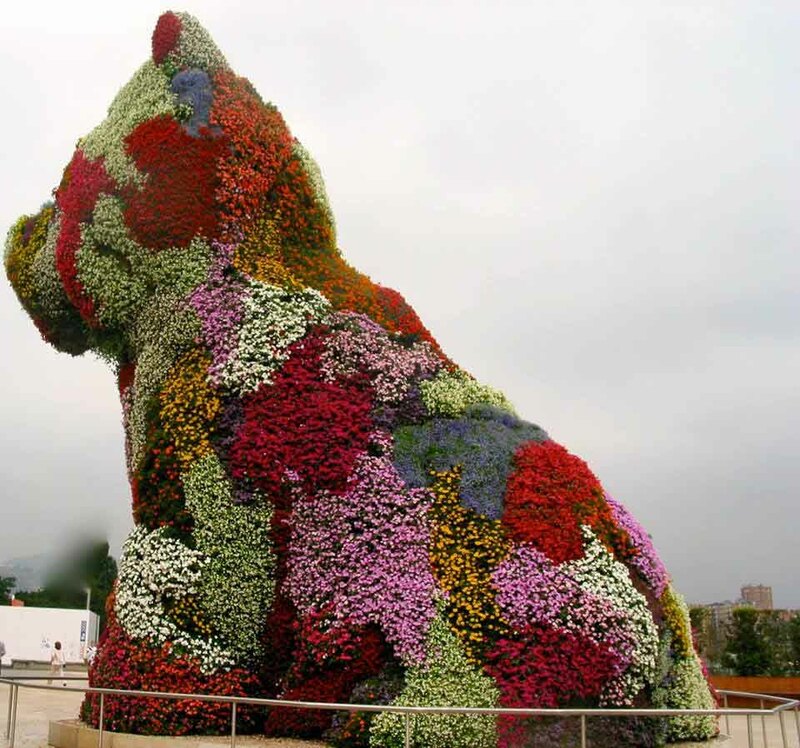 I made a bet that I could replicate (smaller version) Jeff Koon’s wonderful, gigantic flower dog in Bilbao. My partner and I were in Spain last summer on a film shoot. Actually, I worked as a teleprompter operator in Guernica. It was an amazing experience given its history. Back to some frivolity, after all we’re in Vegas! My friends and I are having fun gardening! On a serious note – I manage to mix fun with work. I work often on shoots both as an associate producer and teleprompter operator. The other day we WebCast a wedding! Riley Gladstone graduated from UCLA’s acting program in 2014. He moved out to Las Vegas and frequently performed on stage along the strip. He has also appeared in a multitude of shows, and was cast in an award winning short film! In his spare time, Riley enjoys hiking and doing yoga. He is also the owner of the office dog, Brandy. Brandy is a very shy dog. She loves to cuddle with the office staff and follows them everywhere they go! Bradley Ericson is a New York native. He started out in film as a production assistant and moved on to become a gaffer. 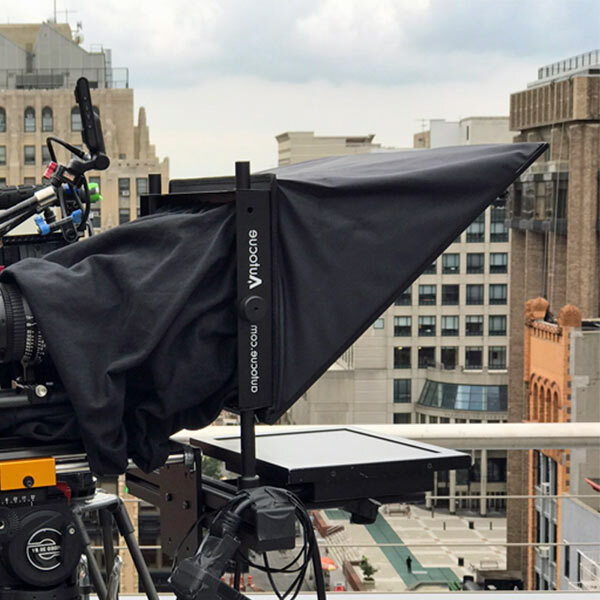 He has worked on a range of feature films and television shows not only in NYC and Vegas, but also in many states across the nation. Before moving to Las Vegas, he worked as a camera operator with a sports broadcast channel. 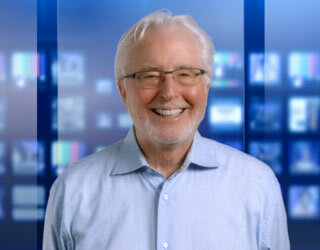 He now heads American Movie Company and Teleprompter Rental’s business operations in Las Vegas. 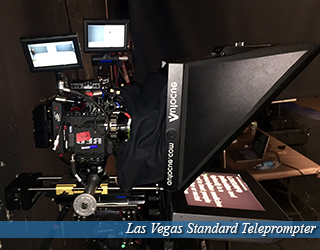 Gerald Scott is a teleprompter operator, gaffer and camera operator in the Las Vegas area. He began working in the film/tv industry in 1995 and has traveled around the nation and abroad shooting documentaries. He enjoys reading up on the latest film techniques and is a model train collector. 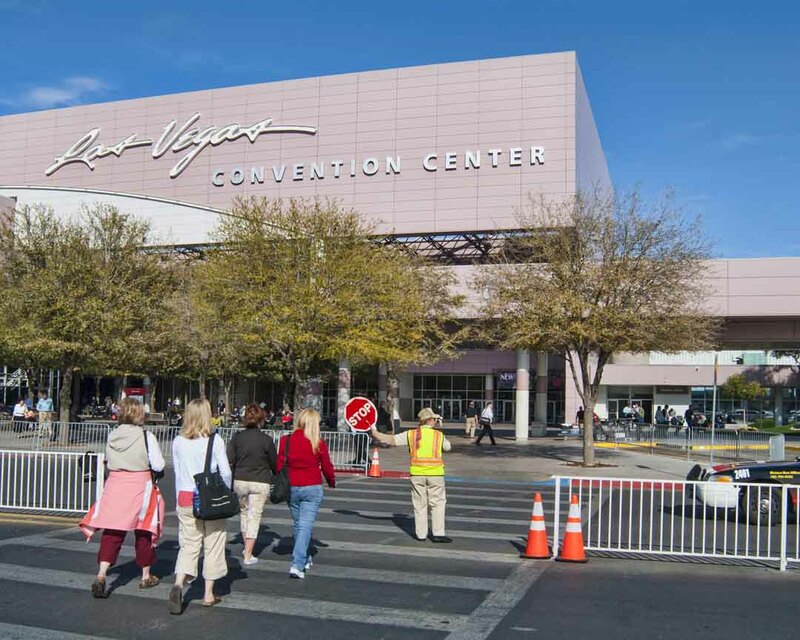 The Las Vegas Convention Center is home to more world class events than anywhere on Earth. Popular events include the NAB, CES and other monster events in the entertainment industry. 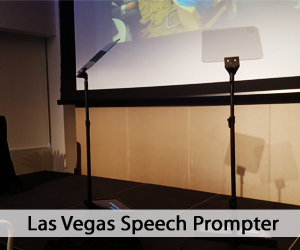 TeleprompterRental.com has provided Presidential Teleprompters, Standard Prompters, Confidence Monitors and Interrotrons to several events. The 3.2 million sq. 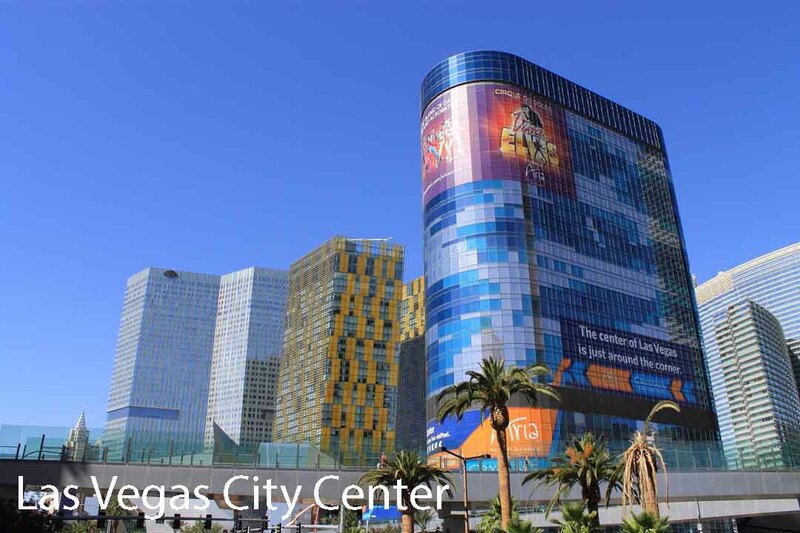 ft. building is located near the Vegas Strip, and boasts not only exhibit and convention space, but also 144 meeting spaces that seat between 20 to 2,500 guests. When you require help with video production, camera, lighting and grip or sound gear, please call us. Our parent company, the American Movie Company and its crew are production specialists. 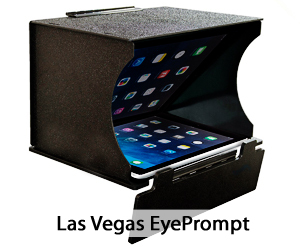 Teleprompters are available in Vegas… and don’t always stay in Vegas! (Am having fun with the saying!) 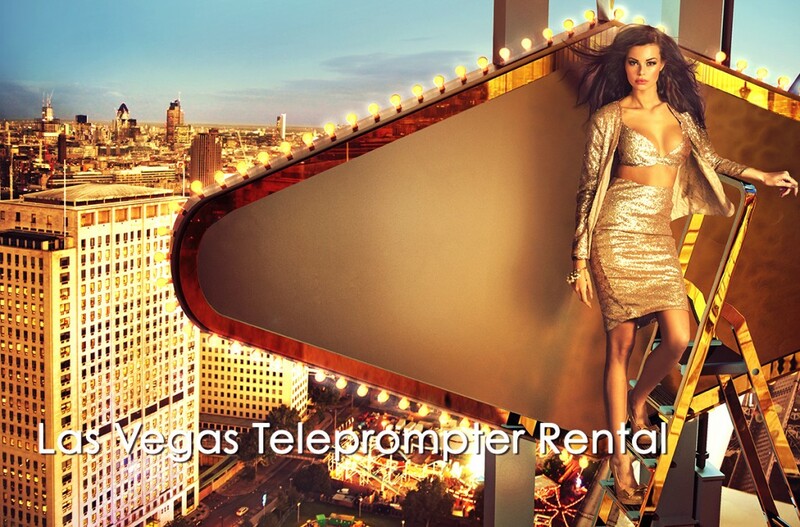 We at TeleprompterRental make them available in many cities across the country. Our prompters are world-class, AutoCue, Gold Plate prompters delivered and operated by experienced professionals. Rental price includes delivery and operation for 10 hours. Overtime is just $65 per hour. We prompt for A-List talent, Fortune 500 executives and major politicians. Feel free to call Bill Milling at: 917-414-5489 for detailed information and to discuss how we can make your project better by providing you with the best. Not only do we have the latest units, we have professional operators ready to work closely with you. Las Vegas draws people from all over the country and the world to its casinos, convention centers and hotels. If you are among those that came to work and then to relax, you might need a bit of help to get rid of the attendant stress. No, I don’t mean gambling. Most decidedly NOT! In fact, I suggest you not gamble with that speech, that lecture. Make certain you remember exactly what to say. Use the teleprompter to take the worry out of that important meeting. Vow to say it right! Call us and we will gladly work with you to make your project a successful one. Afterwards you can let go… explore the both the decadent and the endless possibilities. I’ll bet you’ll return to Vegas and I’ll bet you’ll call us again when you need a teleprompter. We don’t roll the dice… we are totally prepared and proud to say we don’t leave anything to chance. We have backups. We anticipate anything that might be a challenge and are ready to meet it. We are a sure bet!